Two thousand four has long been one of my favorite vintages in Piedmont. The Nebbiolo perfume that lifted into the sky in the weeks following the harvest was pure seduction. In barrel and later in bottle, the 2004s have always been exceptionally finessed wines. After having tasted quite a few 2004s in recent months, I was tempted to open these two bottles. The 2004s continue to age gracefully, although on this night I found both of these wines less expressive than they have been in the recent past. Beppe Rinaldi’s 2004 Barolo Brunate-Le Coste is a favorite. I was fortunate to purchase a few cases of the 2004 when it was first released and have never regretted that decision. This bottle, from the list at Maialino in New York, is superb. Powerful, tightly wound and incredibly persistent on the palate, the 2004 is a joy to drink on this night. I have had slightly more expressive bottles than this one, but all the elements are very much in place. In particular, the 2004 offers a stunning interplay of expressive, balsamic-inflected Brunate aromatics, striking inner sweetness and a classically austere sense of structure that underpins it all. Tar, rose petal, licorice and tobacco overtones add nuance through to the sinewy, imposing finish. This is a dazzling Barolo by any measure. Readers lucky enough to own the 2004 can look forward to several decades of thrilling drinking. 97+/Drinking window: 2020-2044. 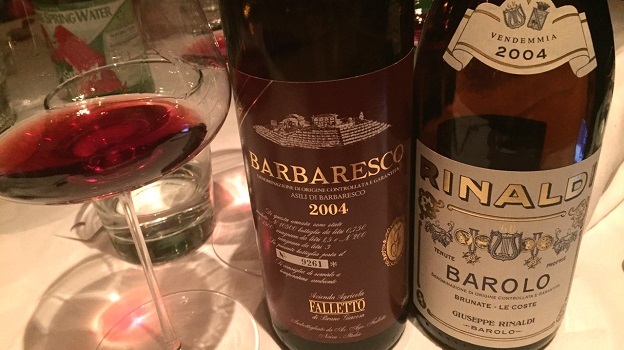 Bruno Giacosa’s 2004 Barbaresco Riserva Asili is pure sensuality. Silky tannins grace the palate as this delicate, perfumed Barbaresco soars out of the glass. In the hands of Bruno Giacosa Asili can take on a Musigny-like sense of weightlessness that words alone could never do justice to. Translucent and beautifully layered in the glass, the 2004 Asili is simply exquisite. Sweet red berries, rose petals, mint and gently spiced notes leave a lasting impression. There is not much else to say other than the 2004 is one of the great Asilis in Bruno Giacosa’s long and distinguished career. 98/Drinking window: 2020-2034.